Plot Summary: Shinji Kido is a carefree, inexperienced reporter for the ORE Journal, becomes Kamen Rider Ryuki in order to protect people from the monsters living inside the Mirror World and stop the senseless war among Riders that Shiro Kanzaki has started. Each Rider (except for Shinji), was lured into the Rider's battle with the promised of having his wish come true if he is the last one standing. Among the chaos Shinji somewhat befriend Ren Akiyama (Kamen Rider Knight) and Kanzaki's sister Yui. 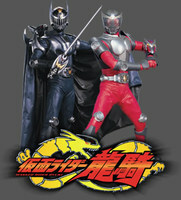 Kamen Rider Ryuki marked a major departure from majority of the Kamen Rider franchise's traditions created by the late Shotaro Ishinomori. Instead of having the monster of the week, the series had numerous Kamen Riders fighting each other for supremacy (much like the Immortals in Highlander). And unlike the other KR titles (with the exception of Shin Kamen Rider), motorcycles had absolutely no important role in this series. Production-wise, Ryuki marked the beginning of Toei's partnership with music giant Avex, Inc. The series also started the trend of not having ending credits and placing the ending theme in the final fight scene of each episode.